AnglicareSA is co-hosting the Adelaide City Plunge in October 2019. Presented by Zenith Events, this is the ultimate charity challenge. 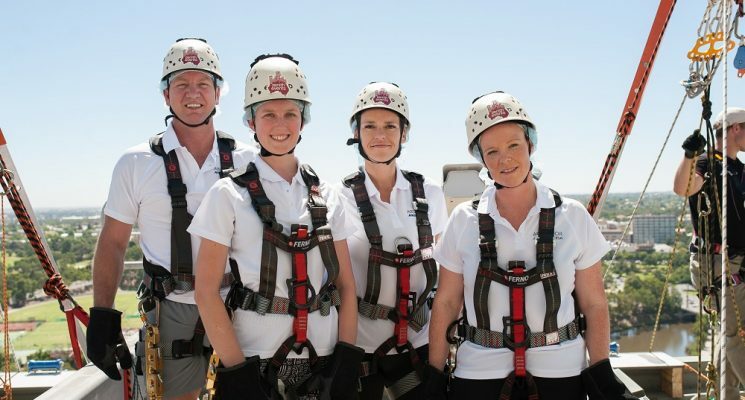 AnglicareSA invites 100 participants to abseil down 132 meters of the Westpac building on the 19th October, to raise money in support of those in our community who are facing much larger challenges every day. Every year AnglicareSA’s homelessness services support up to 7,500 South Australian households. Donations to the Adelaide City Plunge will enable our Emergency Assistance Centres to provide a safety net to families and individuals who are homeless or at risk of becoming homeless. 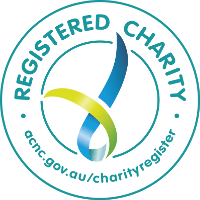 AnglicareSA has partnered with the online fundraising platform Everyday Hero so that registrations and fundraising are all managed through this easy to use site. Sign up as an individual or a team today and join other daring fundraisers for a worthy cause and unique experience. But be quick, as places are limited. This event is open to anyone over 16 years (with parental permission and a chaperone if under 18), and of all fitness levels. 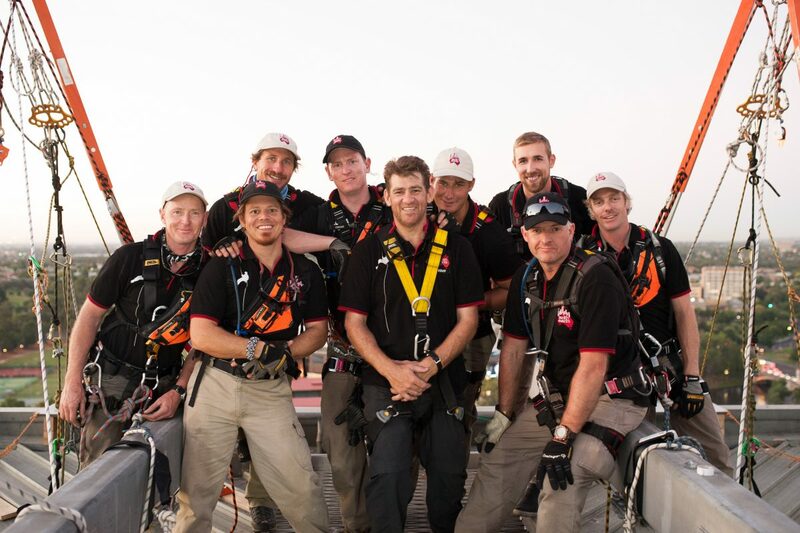 The event will be run by Zenith Events; an adventure based Events Company with a 100% safety record. 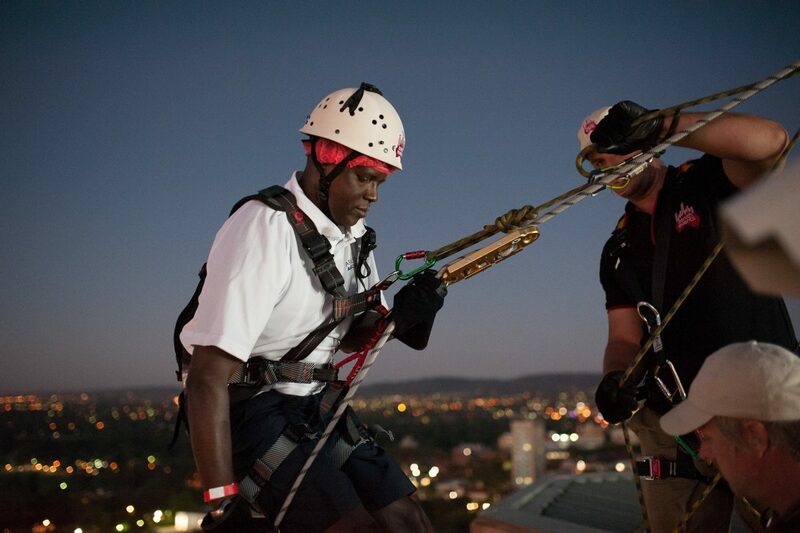 Qualified abseil professionals will be on-site to prepare and guide each participant on the day. Are you willing to take the plunge? By challenging yourself today, you will help someone else overcome their daily challenge. Register now! Can you join us in bringing hope to those who need it most this festive season? 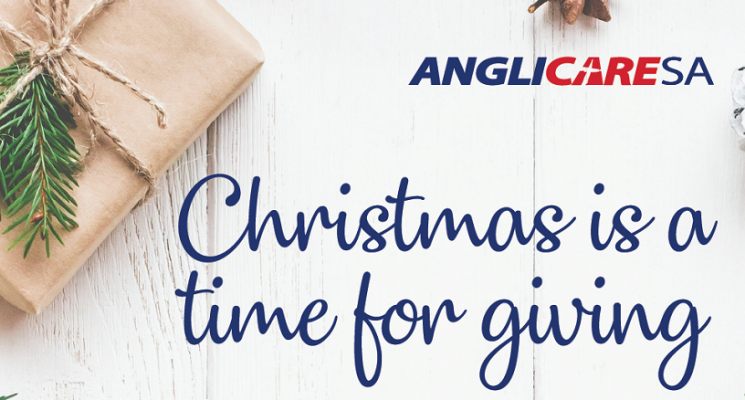 Each year, AnglicareSA provides Christmas gift hampers to hundreds of disadvantaged individuals and families. This Christmas we’re aiming to hand out over 1,000 Christmas gift hampers to support families, adults and individuals who have no one else to turn to. We would appreciate your help by donating charity Christmas gifts items that will go towards building a gift hamper for someone in need. Through your support, you can help make Christmas a very special time of year for those who are less fortunate. Download this printable list of Christmas Hamper & Gift Ideas now. All sites are open from 10am to 4pm Monday to Friday. Donations can be made up until the 7th of December for inclusion in hampers. Thank you for your generosity. If you need to arrange pick-up, please contact 1300 467 372 or email [email protected] to book a collection time. From vulnerable to valued. Grab pole position and change a young person’s life… forever! 500 Rymill House 28 February to 3 March 2019. Join us at Australia’s largest ticketed action packed, ground-breaking motorsport spectacular, the Superloop Adelaide 500, and you’ll be in pole position with a trackside seat while supporting AnglicareSA to empower young vulnerable people at the same time. 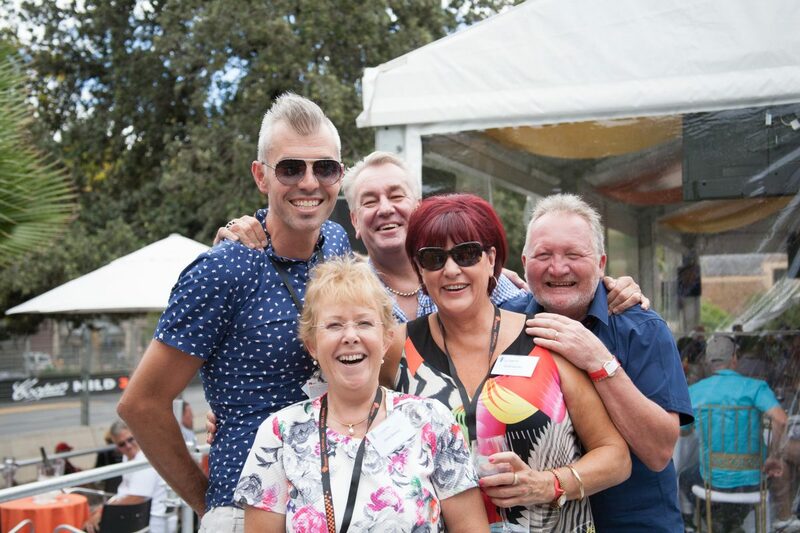 Thanks to our friends at the Rymill House Foundation, AnglicareSA has unprecedented access to the finest corporate hospitality at one of the world’s best touring car races from the state’s most prestigious venue – Rymill House. Taking place on a shortened version of the former Formula One grand prix circuit, it features some of Australia’s favourite corners, including the Senna Chicane, the deep-braking hairpin at Turn 9 and the now infamous Turn 8 sweeper. 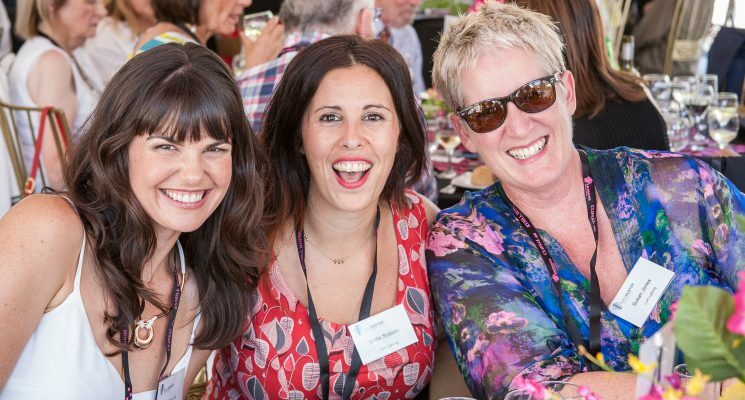 Purchase your ticket today for Australia’s largest domestic motorsport event and you’ll get exclusive access to 500 Rymill House Estate corporate hospitality, the place to see and be seen – with unprecedented networking opportunities amongst the who’s who of Adelaide, all while supporting an incredible cause. 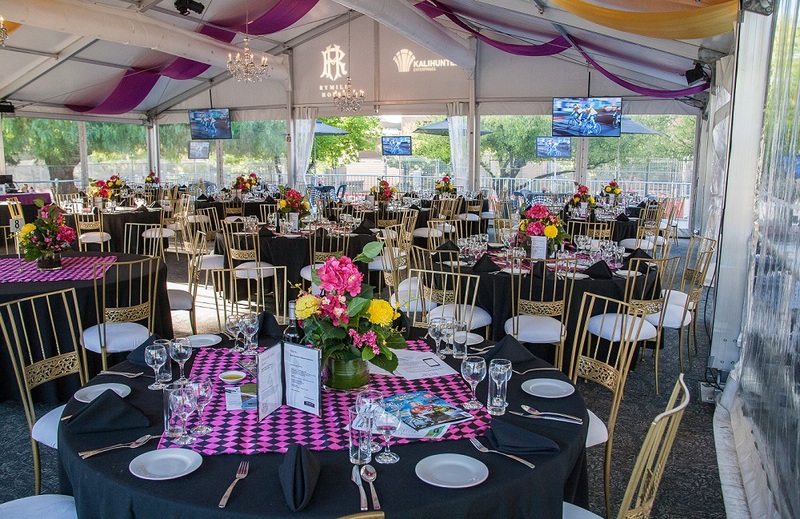 The Superloop Adelaide 500 is held across four days from 28 Febrary to 3 March 2019 and the Rymill House Estate offers spectacular corporate hospitality each day. Thursday and Friday are the ideal days to bring your top performing employees, recognise their hard work, reward for their efforts and motivate them to continue delivering excellence. Saturday and Sunday are perfect for impressing your VIP stakeholders with incredible corporate hospitality. With all day fine dining, premium bar service, alfresco balcony and air conditioning, at Rymill 500, you’re so close to the action, you can almost touch it! Tickets start from just $330pp. All day, half day, and single session options available. Trackside chauffeur services and endless networking opportunities! AnglicareSA has access to a limited number of tickets which sell out fast, so book your table now. Enjoying a Christmas morning coffee on the beach will go a long way to helping those less fortunate, thanks to the generosity of a Henley Beach business. 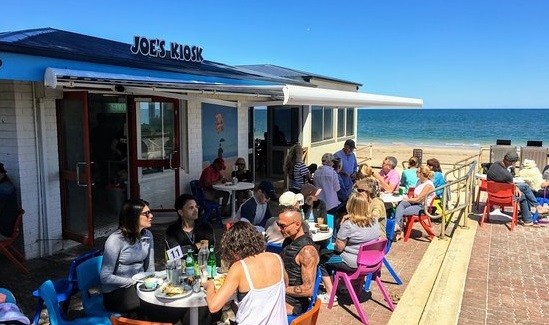 Staff at Joe’s Kiosk, Henley Beach, will donate their time on Christmas Day to make take away coffees for beach goers and raise money for those in need. Joe’s Kiosk will be open from 7am to 11am on Christmas Day serving take away coffee, with all proceeds going to AnglicareSA. AnglicareSA CEO Peter Sandeman said the partnership with Joe’s Kiosk came about when the owner and staff of the Kiosk approached the Anglican Parish of Henley and Grange to find a way they could help the local community. “For staff to voluntarily give up their Christmas morning and their pay to serve others is a truly generous way to celebrate Christmas,” he said. 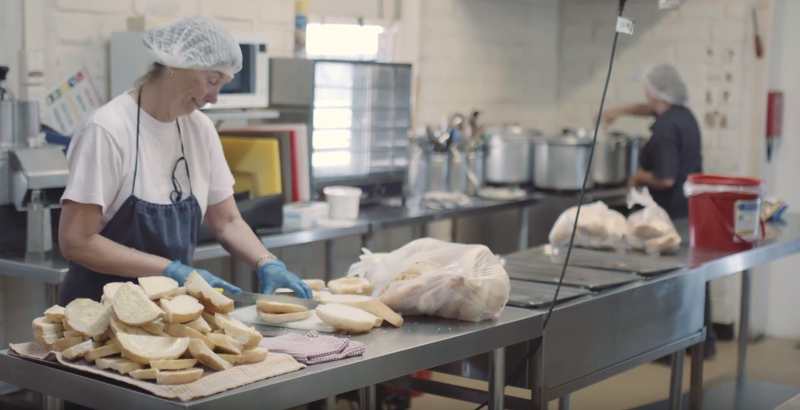 Across South Australia AnglicareSA’s Emergency Assistance programs have assisted more than 8,000 households on 13,000 occasions in the past year. AnglicareSA’s five metropolitan and three regional emergency assistance sites offer fresh fruit and vegetables, bread, frozen and chilled foods, pantry items, clothing assistance, medical support, housing advice and financial counselling services, and connect clients with other services they may require. “I encourage everyone heading to the beach for Christmas morning to treat themselves to a coffee at Joe’s kiosk and help make a difference in the lives of people who need it most,” Peter said. AnglicareSA is calling for South Australians to dig deep and donate to its emergency assistance program as demand for its services grows, forcing the not-for-profit to turn away hundreds of people in financial hardship each month. AnglicareSA conducts a regular Turn Away Census to keep up to date with the changing level of need across the community. During the November 2017 census week, 236 people received emergency assistance (EA) across AnglicareSA’s five metropolitan EA sites, but a further 148 people were turned away without receiving assistance. Seven people were also turned away from two country EA services (Whyalla 6 and Wallaroo 1). AnglicareSA CEO Peter Sandeman, said that the greatest degree of unmet need was in Adelaide’s northern region, where the Elizabeth Mission and Salisbury sites reported a combined total of 68 percent of all turn aways from EA sites (43 in Elizabeth and 59 in Salisbury). “Despite the efforts of AnglicareSA and other social service providers to alleviate hardship, the data in our latest census demonstrates a continuing high and unmet need,” he said. The key reasons for presentation at emergency relief sites continue to be inadequate income to meet the costs of living, and bill pressure – particularly utility bills. The community provides volunteers, contributes food and makes donations to support the delivery of emergency assistance. To make a tax deductible gift to our Christmas Appeal, donate online or telephone 8305 9205.